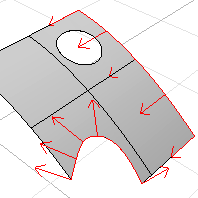 The DupEdge command creates curves from the selected surface or mesh edges. Select the edges of a surface or mesh object. Use Ctrl + click to deselect a selected edge. The curve created from a trimmed surface edge has a different control points structure than the curve used to trim the surface.